Modify scene settings in the inspector panel. Details – Update the scene's name and description. Tags – Add metadata tags to the scene. Custom attributes – Add metadata key-value pairs to the scene. You can save a copy of your scene as a template to use as a starting point for creating other scenes. If your scene is saved to a project, the template is saved to the same project. Otherwise, you must choose a project to hold the template. 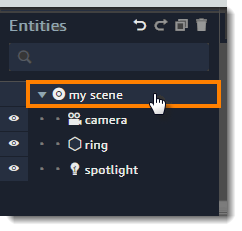 Expand the scene section in the inspector panel. Choose Save scene as template. If the scene is a draft, choose a project for the template. You can copy or move templates between scenes in the dashboard. You can update a template by creating a template again from the same source scene or from a scene created from the template. When you save a template, you can choose to create a new template or update the existing template. 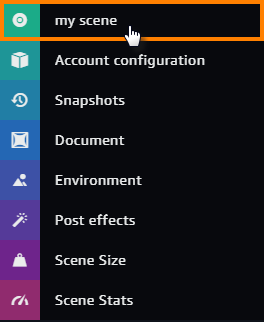 Collapse the scene settings section by choosing the name of your scene.